Bag Snob protests the rocketing prices of luxury bags. Fashion Tribes talks to David Wolfe of the Donegar Group about trends for Fall 2007. Coquette takes us shopping for wide leg jeans. Style Bites talks with emerging designer (who we love, btw) Jason Wu. The Beauty Addict reports from backstage at the Proenza Schouler Fall 2007 show. Blogdorf Goodman tells us how to recreate the makeup look by Pat McGrath at Oscar de la Renta Fall 2007.
eBelle5 announces Target's latest foray into massclusive accessories: Devi Kroell for Tar-jhay. An exclusive interview with Alice Ritter from the Trashionista. Clockwise from top left: Temperley Fall 2007, Doo.Ri Spring 2007, Antonio Berardi Spring 2007, Chloe Spring 2007, Anne Valerie Hash Fall 2007, Celine Spring 2007, Temperley Fall 2007, Chanel Spring 2007 Haute Couture. Photos: Style.com, Vogue.fr. Click image to view larger. From a marketing standpoint, the Lancome Pout-a-Porter collection is sheer genius. As the release date of the second lipstick in the series is fast approaching, I thought I'd take a moment to discuss what makes the product line so special. A little background for those of you who haven't been following the Beauty Addict's coverage of the collection: For Fall 2006, Lancome created a limited edition red lipstick based on the lip color used on the models at the Behnaz Sarafpour show. The lipstick, called "Behnaz," sold out before you could say Sarafpour. 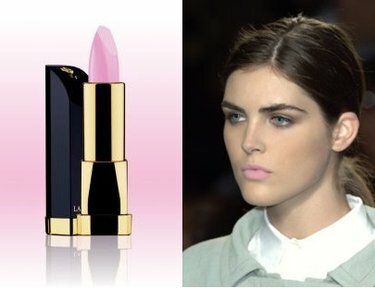 Pictured above is "Proenza Pink," based on the surfer girl-inspired pale pink lip seen at the Proenza Schouler Spring 2007 show. - Brand collaboration. With the Proenza and Lancome on the label, this lipstick is sure to get the attention of fashionable women. Additionally, by associating itself with cult designers, Lancome is increasing its fashion credibility relative to its competitors. - Excellent exposure. With the number of fashion-obsessed females looking at runway photos online and the readership of magazines in which backstage beauty shots are published, runway makeup looks get plenty of exposure. Lancome is taking advantage of this by letting customers know that it is behind some of the season's hottest looks and packaging them in the form of lipsticks. - Pretty Pictures. As the provider of the makeup for shows such as Behnaz and Proenza, Lancome sees its product photographed on some of the best models in the biz. And girls like Hilary Rhoda, Natasha Poly, and Agyness Deyn don't just make clothes look good! The universally flattering and utterly cool Proenza Pink will be sold at Bergdorf Goodman, Lancome-USA.com, and select Neiman Marcus stores beginning March 1. Black opaque tights with a slight sheen have been a popular choice among stylists working the fall 2007 shows in New York. Stop by your local costume or dance wear store and snag a pair if you're looking for an easy way to update your look! Photos: Shiny black tights at Oscar de la Renta, Temperley, and Malandrino. Tracy Reese, Naeem Khan, Rag & Bone. Spring's sporty theme continued at Reyes, Thakoon, Derek Lam, and Narciso Rodriguez. Several designers have used velvet in their fall collections, but few have managed it as successfully as Marc Jacobs, Chaiken, or Behnaz Sarafpour (pictured above); Oscar de la Renta, Terexov, Temperley, or Douglas Hannant (not pictured). 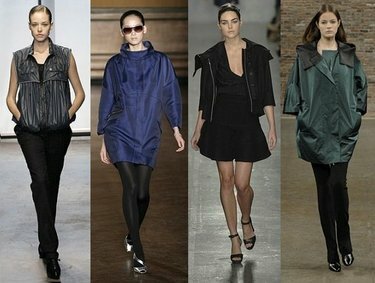 We are only three days into fashion week fall 2007 and already it's clear that a number of trends from spring 2007 will last all year long. If you liked the metallic looks Aesthetics + Economics presented after fashion week in September, go ahead and invest in a silver, pewter, platinum, or gold piece. From a utility standpoint, you'll get a lot of use out of it! Designers from left to right: Naeem Khan, Carolina Herrera, Tracy Reese. We know and love Alice Ritter for her cool, coquettish designs. Her clothes are smart and appeal to the most chic of show goers (and quite literally so--the audience at the French designer's Fall 2007 show was one of the best dressed I have ever seen at fashion week). For fall, Alice succeeded in producing original, wearable pieces imbued with her signature charm and sense of subtle stylishness. 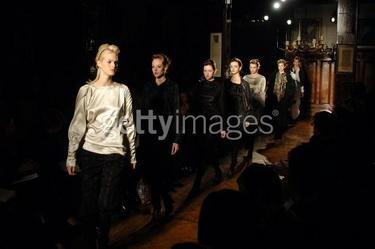 Highlights included some great, creative coats and jackets, as well as a number of simple, satin dresses and tops. The dominant colors and trends in this collection were the colors amber, champagne, plum, navy, black, and white, the use of satin and light brocades, and the forms--more skinny black legs, trapeze and shift dresses, and--wait for it--breaches. More pictures after the jump! PS - One more reason to love Alice Ritter? She studied economics in Paris! Hello and my apologies for the lack of posts this past week. As you all know very well, fashion week is here. Stay tuned for reviews! First up: Alice Ritter.